A few minutes after class begins, I step into the Carson 61 classroom to see what’s happening. The students are already abuzz, divided into three learning teams and rapidly dissecting Latin phrases on the board. Interruptions are frequent as students yell across the room to one another with new ideas and corrections, or to flag down the instructor, Dr. Suzanne Lye, to pepper her with questions. The scene is not so much chaotic as rambunctious; like a house party where everyone is playing Monopoly. It’s a little disorienting to an outsider and prompts many questions: Where are the desks? Where am I supposed to stand? Who is the teacher here? 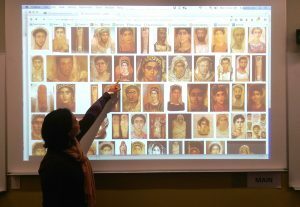 Dr. Suzanne Lye points out features of the portraits of the Fayum mummies, a gateway to understanding the ancient Romans as real people with individual histories. The collaborative nature of the course plays out like a bouncing ball, with Lye and Chaudhary sometimes throwing questions at the students, the students sometimes throwing questions back at them. In quick succession, classroom activities switch between students’ collaborating to translate Latin sentences on the board, a mini-lecture by Lye about Roman multiculturalism and the Roman portraits on mummies from Fayum, Egypt, and Latin bingo, led by Chaudhary. 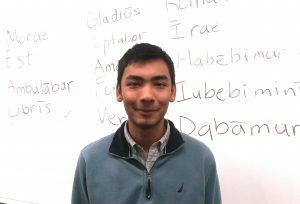 Shaket Chaudhary is a Learning Fellow in Latin 1, providing teaching support to Dr. Lye and peer mentorship to the students. Chaudhary designs and leads some of the review games used in class. Games like bingo are frequent features of the course. Trained in improvisational acting, Lye likes how “play” and games can work different parts of the brain. Her course brings these techniques to the classroom, hoping they will help students integrate Latin into their lives and memorize its core components by applying them in different situations. Chaudhary helps research and invent games with Lye to drill both vocabulary and concepts. During Latin bingo, for example, Chaudhary writes vocabulary words on the board while students must quickly match words to their morphological attributes, as described on their bingo cards. When a student yells bingo, they have to prove it by teaching the class which words go with which attributes. If a student gets one wrong, it’s not a mistake, just a “false alarm.” Play proceeds till the next “bingo” and until all the vocabulary words are matched. Other games – like campus-wide scavenger hunts, elimination (modeled on the format of spelling bees), and improv skits – hone students’ vocabulary and syntax skills. 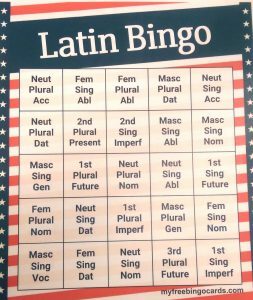 Latin bingo, a review game used in class, was developed during a design meeting with Dr. Lye, Chaudhary, and Jess Fedin, the course’s Media Learning Fellow. The students in Latin 1 have requested playing the game on multiple occasions. Games and play create an electric atmosphere in Latin 1. The dynamic classroom space and collaborative teaching approach fulfill many of the desires behind “gameful learning,” including flexibility, individual expression, and staged mastery of the material. Though seemingly playful, the experience in Latin 1 is carefully crafted: Lye has meticulously outlined the trajectory of the course and how different types of students might converge and diverge from this path. She has an arsenal of ready-made activities to handle potential outcomes. She holds weekly design meetings with Chaudhary, Jess Fedin (the course’s Media Learning Fellow), and Colleen Goodhue (the Media Production Group) to assess outcomes of the different activities, re-design less successful ones, and plan new ones. She invites Chaudhary and Fedin to share their impressions from the student perspective and to take a leadership role in designing activities and mentoring students. 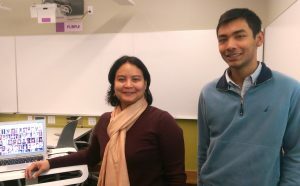 Dr. Lye (left) and Chaudhary (right) work as a teaching team to create an innovative, dynamic learning environment for the students in Latin 1. The result of Lye’s intentionality is a course that makes a seemingly “dead” language feel real, close, relevant, and very much alive for its students. But for all the construction behind the course, there are some elements that just can’t be planned. Take Lye’s passion for Latin – it arises spontaneously from her, without any effort at all. “Do you know the word ludus?” she asks me, ever the teacher. I don’t. “It’s the Latin word for ‘school,’ and it’s also the Latin word for games and play. The Romans thought of education like a kind of sport. Ludus is the theme for this course.” I smile as I’m swept away by Lye’s enthusiasm. I hear cheers from a group of students as their teammate gets all her bingo words correct. I’m not the only one who’s just learned something new. This entry was posted in Uncategorized on February 1, 2017 by Katherine Schroer.